Apple has expanded its trade-in program, which offers credit towards new device purchases in exchange for older hardware, to non-Apple smartphones and PCs (via 9to5Mac). 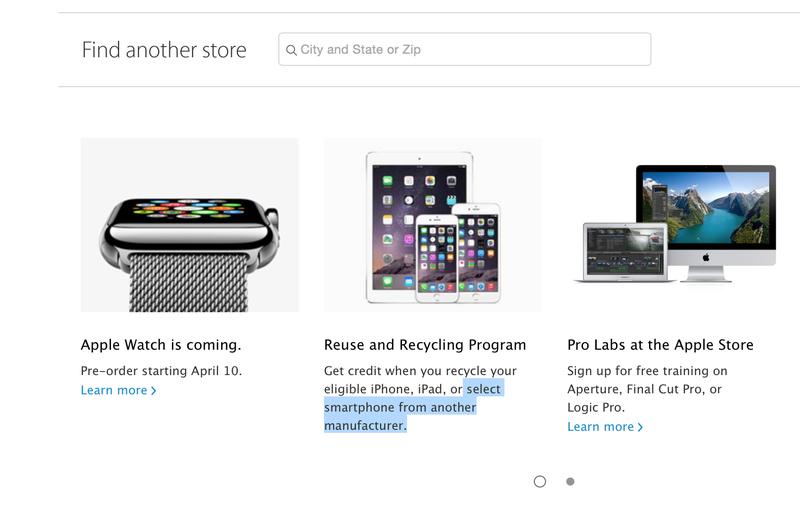 News of the program expansion comes from changed language on Apple Store pages describing the reuse and recycle initiative on Apple’s U.S., UK, Canada and some other European store sites. The trade-in program is operated by third-party partners to Apple, which helps explain why they’d also be interested in securing older non-Apple hardware for refurbishment. Expanding the program also helps Apple add incentives for switchers looking to come over to either iOS or Mac from a different platform, including Android and Windows. Eligibility for the program covers the vast majority of flagship Android manufacturers, Apple tells us. These include (but are not necessarily limited to) Sony, Samsung, Nokia, LG, HTC and BlackBerry devices specifically. Even if devices aren’t included because of age or condition, Apple will still help customers recycle old hardware. PC trade-ins appear to be fairly broad in terms of what’s included, but it’s liable to change on a country-to-country basis, as Apple has different partners in each region for its credit swapping programs. The new expanded trade-in program is live in the US, Canada, UK, Germany, France and Italy as of today.